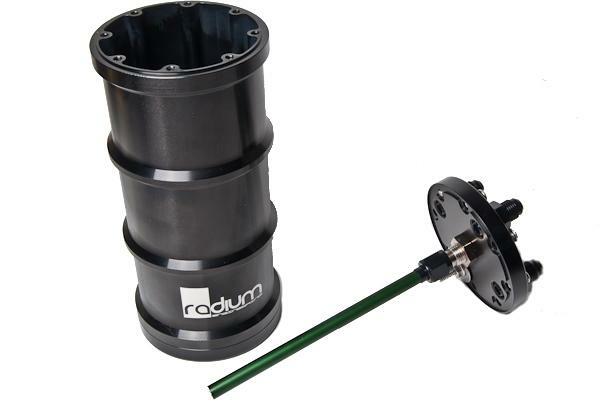 Radium Fuel Surge Tank - External Pump UNIVERSAL - Dezod Motorsports Inc - Home of the automotive performance enthusiast since 2002. A fuel surge tank (FST) is designed to prevent fuel starvation to the engine on vehicles with inadequate fuel tank baffling. The FST fuel pump(s) feed the fuel rail(s). The volume of fuel inside the surge tank acts as a buffer to always keep the FST pump supplied with fuel. This volume is maintained by the main fuel tank’s pump as well as the fuel returning from the fuel pressure regulator. Excess fuel in the surge tank is returned back to the vehicle’s main fuel tank. The surge tank also provides a quick and easy way to upgade any standard fuel system with a compact size. This is an excellent fueling solution for vehicles installing large demand power upgrades such as forced induction. 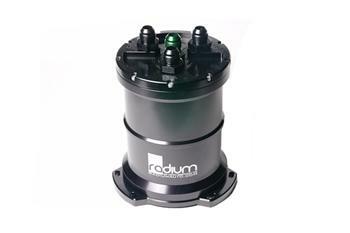 Radium Engineering “pumpless” FSTs were designed for users that already have a secondary external fuel pump. It provides a reservoir from which an external pump can draw from. It features a single or dual anodized aluminum pick-up tubes rather than an integrated internal fuel pump. Thus, this FST model does not include a bulkhead wiring adapter so it is not suited to be used with a fuel pump inside of it. This surge tank is most effective when mounted vertically, however it can be tipped up to a 45 degree angle. Radium does not recommend mounting this surge tank horizontally, as the pick-up may be prone to drawing in air pockets. The High Volume fuel surge tank (HVFST) is an ideal option for very high flow external fuel pumps requiring a large reservoir and feed line. It must be mounted as near vertical as possible. A mounting bracket is not needed with the HVFST. All external pump fuel surge tanks require a “lift pump” to supply them with fuel. Excess fuel is then routed back to the OEM fuel tank or fuel cell. The pump feeding the engine, then draws it’s fuel from the surge tank, with excess returning from the regulator back to the surge tank.